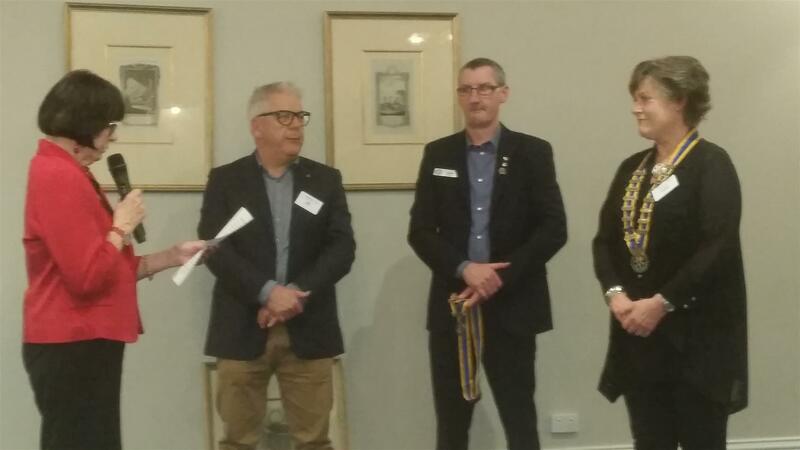 It was the first combined RC Geelong West and RC Lara District changeover and David Dadds welcomed all members and guests and DG Jane Cox and ADG Kathy Ryan. Pres Chris Kinley gave respect to the Elders and gave the invocation while ADG Kathy proposed the toast to Rotary International. She noted that we are members of something bigger and better than we could be by ourselves and instanced Polio Plus where there have only been 16 cases of polio this year in two countries. Jane responded to the toast to Rotary International by noting that we are the cogs in the wheel that does the work. She said “We do good – Be proud”. Later in the evening DG Jane inducted Marie Nunan as President of RC Geelong West for the year 2016-17. Marie introduced her Board of Nick Klein, Robert Sawyer, Trish Roberts, Theresa Best, Freda Wright and Geoff Morgan. Jane also inducted Chris Kinley as President of RC Lara District for 2016-17. Chris introduced his Board of Pierre Debetts, Tania Brimley, Mandy Thomas, Nola Brimley, Katie Odgers-Hayes and Sean Thomas. Pres Marie thanked the Club for the honour and noted that each President gives leadership. She thanked Jim as an agent of change and noted that she hoped to lead the Club to implement and consolidate that change. She is positive and is sure that RCGW and RCLD have much to gain in their new relationship. We will collaborate with style and humour. Pres Chris looked forward to the year with Lara District and the relationship with Geelong West. DG Jane told us all that she was delighted to see Lara District and Geelong West working together and wished us all the best in the future. She was happy to have been involved with both Clubs.